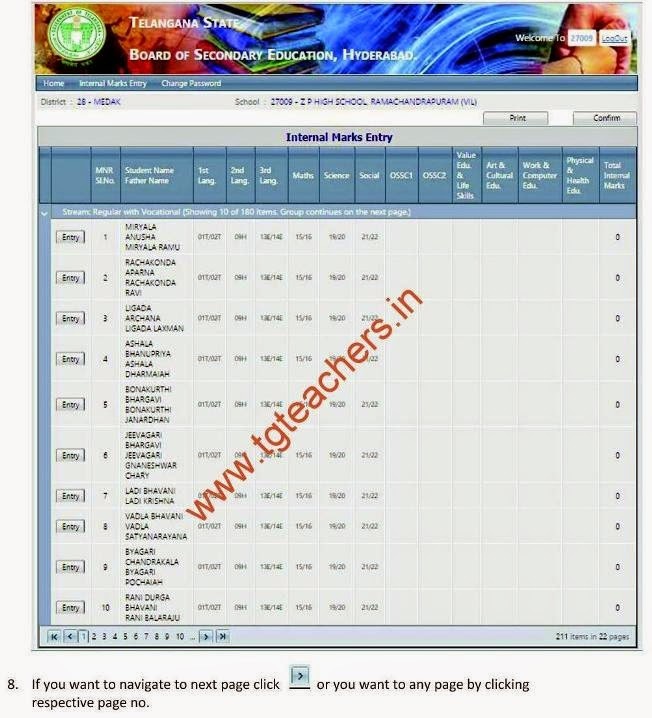 Board of Secondary Education Telangana has released the Instructions/Guidelines for TS High Schools HMs for Internal Marks Entry of SSC Students in the Official Web Portal of BSE Telangana State www.bsetelangana.org. Online feeding of internal marks is altogether different from Online furnishing of SSC candidates data. This User manual contains the "Procedure for working out the Formative Tests Marks and Co-Curricular Tests", and "Procedure for Online Feeding of Internal Marks" by the Head Masters of High Schools in Telangana State . Step by Step procedure for Online Feeding of Internal Marks is given below. Note to HMs: An opportunity was given for correction/revision in Students data previously. But no such facility will be provided for Online furnishing of internal marks. Once the marks entered and confirmed by the Headmasters it is sealed once for all. Therefore utmost care shall be exercised by the Headmasters. The entire work should be completed under the close monitoring of the Headmasters concerned. 1) Once the cumulative records of internal marks as well as Co-curricular areas are ready Online feeding of internal marks shall be taken up as and when the schedule is announced. 2) Before proceeding with the Online work, the Headmasters and his Staff are informed to be thoroughly conversant with the G.O Ms.No.17 dated 14-05-2014 and the G.O.Ms.No.2 dated 26-08-2014. 3) The Headmaster has to take utmost care while feeding the marks in the computer. He shall not entrust this item of work to any other Person but he may take the assistance of others. He has to ensure the marks of one candidate are not posted for another candidate. 4) The internal marks of all subjects of a candidate i.e., both curricular and co-curricular shall be entered in the computer. If any field of any candidate not entered, the computer will not allow you to move further. 5) In case of candidates who are exempted from taking 1 or 2 Languages as per the G.O.Ms.No.33 dated 19-03-2001 (Physically Handicapped candidates) the columns meant for entering internal marks in such cases are already disabled. 6) In case of candidates who are genuinely Physically Handicapped but not shown as Physically Handicapped in the students, Headmasters has to enter ‘0’in the column meant for entering the internal marks of concerned language/languages. But the Headmaster cannot decide himself whether such candidates comes under the purview of G.O or not unless he has already submitted Physically Handicapped certificates issued by the District Medical Board to the O/o the Director of Government Examinations. Otherwise the candidate’s result will be declared as Withheld. 7) After completion of entering of marks, the Headmaster can take printouts in sufficient numbers and handover the printouts to the candidates for their verification and signatures. This helps avoiding the wrong posting of marks, posting of one candid etc., Then verify the data with reference to the corrections made by the students, cumulative records etc., thoroughly with the help of other teachers. Carryout the corrections if any, take the print out and verify it again to ensure 100% accuracy of the data. 8) Once the confirmation is done in the Computer, the editable option will be closed once for all. Now take 3 printouts and authenticate the reports by affixing the Headmaster signature. Take the printouts along with the subject wise as well as cumulative records to the concerned Deputy Educational Officer for further verification and authentication. The Deputy Educational Officers will verify the printouts with reference to the Registers brought by the Headmasters and sign the printouts in token of his verification/authentication. The Headmasters shall have to preserve one copy in their schools as a permanent record for future references and inspections. The other 2 copies will have to be handed over to the Deputy Educational Officer. The Deputy Educational Officers inturn will send one copy of the internal marks of all the Schools of his division to the District Educational Office on the scheduled date while retaining one copy with him. If you want to navigate to next page click -> or you want to any page by clicking respective page no.